End-of-life care is traditionally limited to two options: hospice services delivered in a clinical setting or in a patient’s home. However, those settings present challenges. Caregivers often feel out of place or even intrusive in patients’ homes, and medical settings are frequently cold and clinical without enough space for family and friends to gather, says Adrienne Faulkner, founder and CEO of design firm Faulkner Design (Dallas). Faith Presbyterian Hospice, the hospice arm of not-for-profit operator Presbyterian Communities and Services (Dallas), was part of that status quo, providing trained staff to deliver hospice services in homes, hospitals, and its skilled nursing communities around Dallas. In 2007, T. Boone Pickens, a business magnate and financier who lives in Dallas, made a significant donation to the project, which kicked off a decades-long donor-driven fundraising campaign to bring the idea to fruition. Construction began in 2015, and the T. Boone Pickens Hospice and Palliative Care Center opened in Dallas in December 2016. The 77,600-square-foot center houses 36 patient rooms with private bathrooms, a café, spiritual center, and multiple family respite areas. “It feels like home but has all of the amenities of being in the hospital, with caregivers and medical equipment,” says Faulkner, who served as principal and design director on the project. The project team outlined five key service areas for the T. Boone Pickens Hospice and Palliative Care Center, including hospice, education and resources, spiritual services, child and bereavement counseling, and outdoor reflection. To organize these elements within a tight, urban 9-acre site, which includes a 5-acre lake, the team decided to build three separate facilities: an inpatient care building for hospice services; a resource and education building to provide training and resources for staff, community professionals, and families; and a future bereavement center. The solution allows the design of each building to reflect its specific function, and breaks the site down into a more residential scale. Additionally, each of the buildings, as well as dedicated outdoor respite spaces, were oriented to take advantage of lake views. “That drove the shape of the building, the programming, and how the entire site was oriented to capture views and connect to the outdoors,” says Paul Donaldson, managing principal at PRDG Architects (Dallas), which provided architectural services. For example, designers used a single-loaded corridor layout for the three-story hospice building to place all the patient rooms on the lake-facing side, each with a set of double doors that open onto a private patio to allow patients in queen-sized beds to be rolled out to enjoy the view and fresh air. The education center and future bereavement services facility are in proximity to the hospice center, so separate vehicular and pedestrian circulation paths were added so that grieving family members don’t need to re-enter the hospice building to access counseling or additional services. A labyrinth and amphitheater were added between the hospice building and the education center to bring more separation while providing additional opportunities to enjoy the site. Extensive landscaping was added, as well, including a covered patio and seating along a public walking trail on the site. “Once you’re on the campus and you’re in proximity to the water, it doesn’t seem like you’re in the center of Dallas. It feels like a retreat,” Donaldson says. Wood ceiling elements are used to denote the staff workspaces on the hospice floors while maintaining a residential setting. The materials palette for the project reinforces the residential feel of the site, including limestone and siding on the exterior. Inside, the strategy was to keep the spaces smaller and use furnishings and materials that feel cozy and comfortable, Faulkner says. For example, a fireplace and walnut flooring in the lobby set the tone for a nonclinical setting, while sunrooms on the patient floors offer couches and coffee tables as well as floor-to-ceiling windows. 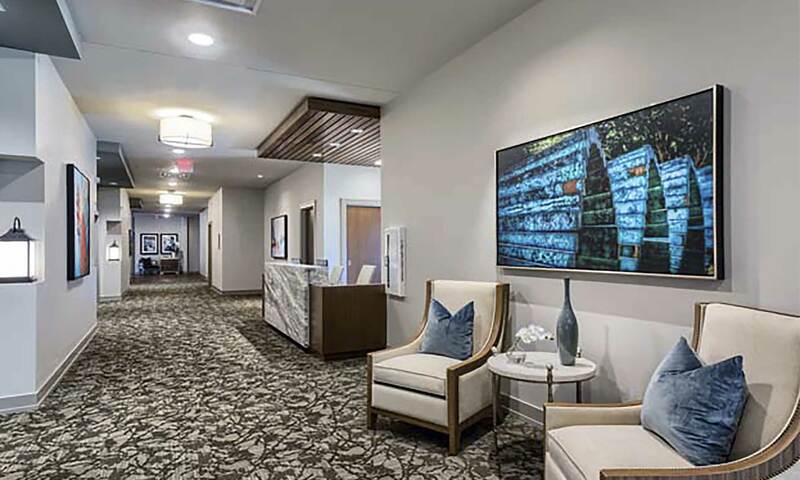 Additional design nuances include a lantern with an LED light outside each room, colored ceiling elements over the patient room doorways that provide a sense of entry and help with wayfinding, and artwork of local landmarks hanging in the hallways and sunrooms. In the patient rooms, medical equipment, gas hookups, and outlets are concealed behind a walnut headwall. To prevent staff from unnecessary interruptions of residents’ time with loved ones, each room has a storage closet that staff can access from the hallway to stock supplies such as towels and linens. The sunrooms provide a space for guests to take a break without having to walk far from their loved ones, while family rooms in the center of each floor include a kitchen, seating area, and TV. Additional amenities, such as a café, meditation and music rooms, play spaces for kids, and a laundry area, are located throughout the building. A nondenominational chapel connects to the hospice building and features stained glass, clerestory windows, and warm walnut finishes. A variety of seating options are provided to allow the space to flex to different seating needs as well as to accommodate multiple types of gatherings. Mallad says he wants the center to help people think differently about hospice. “We conducted focus groups to find out what families needed or enjoyed most during the tenure of their loved one’s stay, and then we incorporated that into the delivery of care,” he says. For example, he says the center has changed its pharmacy services and modified its meals to better meet the needs of patients. In addition to onsite music, massage, and pet therapies, the staff also now allows families to bring in family pets for a visit. Among the design details, Mallad says feedback on family gathering areas on each floor as well as the grounds, including the access to nature, the water views, and the serene setting, has been overwhelmingly positive. “It’s an environment that’s conducive to those wishing to have a meaningful end-of-life experience alongside their families and friends,” he says. Anne DiNardo is executive editor of Environments for Aging. She can be reached at ANNE.DINARDO. Total building area: 77,600 sq. ft.
Engineering: Murray & Associates Inc.